Update, May 2: The new Red Dead Redemption 2 trailer is here. The latest Red Dead Redemption 2 trailer has arrived. The trailer, which you can watch above, was released by Rockstar this afternoon. While you’re waiting, here are 7 games like Red Dead Redemption 2 you can play on PC. This trailer confirms the new game will be a prequel set in 1899, over a decade before the original game. John Marston is also featured here, in some dire straits. 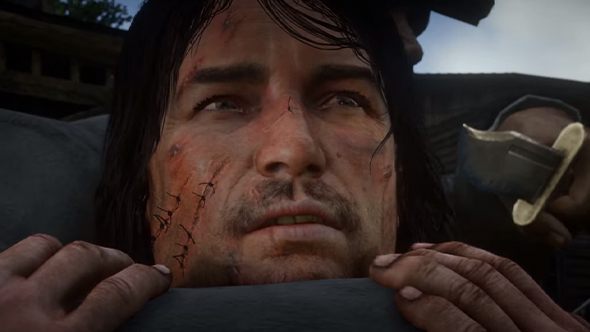 Marston’s voice actor, Rob Wiethoff, notably retired from the industry having worked on no other game – it’d be surprising to see him back, but that sure does sound like John at the end. As per Rockstar standards it’s a collection of cinematics and story beats rather than gameplay footage, but let’s be real – they don’t need to do much more to sell the world on RDR2. Sadly, there’s still no word on when (or if) Red Dead Redemption 2 will come to PC. In fact, everything Rockstar have said so far suggest it’ll definitely be a console-exclusive launch. It took them a while to bring GTAV to PC though, so here’s hoping it eventually makes its way over from console. Original story, April 30:Rockstar will release the third official Red Dead Redemption 2 trailer this Wednesday May 2, at 11:00 ET / 08:00 PT / 16:00 BST. Unfortunately there’s still no word of a PC release, with Rockstar saying only that the game is coming to PS4 and Xbox One at launch on October 26. The publisher announced the new trailer on their website and on Twitter, as you can see below, along with a new banner for the game. Earlier on today Amazon leaked the existence of an art book for Red Dead 2 coming alongside the game in October, so at least that’s something PC owners can stare at while console players enjoy themselves. The original Red Dead Redemption infamously never came out on PC, for a variety of reasons, although it is at least playable through Sony’s Playstation Now streaming service. Rockstar stablemate Grand Theft Auto 5 did finally come to our platform, and with a first-person mode and major graphical polish, but it took a year and a half to do so. How Rockstar approach a possible PC version of Red Dead 2 is anyone’s guess, but it’s looking all but certain that it won’t happen alongside the console launch. Let’s hope we won’t have to wait for the next console generation again, at least.